Dalton Highway in Alaska is one of the most isolated roads on the planet. It is also one of the most dangerous. At four hundred and fourteen miles long, the road will take you from the Elliot Highway, which is a few miles north of Fairbanks to Prudhoe Bay, near the Artic Ocean. It was originally built in the 1970’s as a supply route for Trans-Alaska Pipeline System. In fact, until 1994, the road was mainly only open to commercial traffic. That traffic was mainly the trucks carrying the oil back and forth from the Prudhoe oil fields. The road has a reputation for being so dangerous that it has been featured on the British TV show World’s Most Dangerous Roads as well as four seasons of Ice Road Truckers. There are crosses and small memorials all along the highway in places where people have sadly lost their lives in past accidents. These memorials serve to honor those we have lost but also help remind us to navigate such a dangerous with extreme caution. However, if you are an adept driver and want to experience the full expanse of Alaska, you should make a point to take the trip down the Dalton Highway. Many have called it “the ultimate road trip.” With the right caution, low speeds, general know-how and proper supplies, you will be just fine traveling on the Dalton Highway. Coldfoot – Mile 175 – Coldfoot is mostly a truck stop. There is one restaurant and few places to sleep overnight. Most recently, the population was reported as thirteen people total. Wiseman – Mile 188 – Wiseman is another sparsely populated stop on Dalton Highway with fourteen people. There are cabin rentals available – you can read more here. Deadhorse – Mile 414 – Deadhorse is the end of the line for the Dalton Highway. It is mostly just an area of various facilities for workers at the close-by Prudhoe Bay oil fields. The population is about fifty people. However, at any given point there may be as many as three thousand workers staying there. There are amenities available at Deadhorse Camp and the Prudhoe Bay Hotel. Usually, there are not many other passenger vehicles on the road either. It is mostly just commercial trucks driven by workers going to or coming from the Prudhoe Bay area. There are no other towns along the highway other than the two mentioned above with a combined population of twenty-seven. There’s also no cell phone service either. Even the police relegate themselves to patrol the highway almost always only by Helicopter. They are only surveying the road to check for accidents or to see if someone needs help. If there are any, they can radio to a ground unit. Traffic violations could not be a lower priority here. If you are not traveling on the Dalton Highway for work, what you can gain during the trip is an incredible view of Alaska and its breathtaking vastness. As much food and water you might think you need for a twelve to fourteen hour drive. Blankets and pillows in case you need to pull over and rest. Extra gas just in case. CDs or something with the ability to play pre-programmed music. You likely won’t get much radio or satellite reception. Extra car supplies such as windshield wipers, headlights, a spare tire, flares, a battery and tools. An ability to charge your phone through your car or a portable and pre-charged charger. Drive slow and always maintain concentration – It cannot be overstated how dangerous this road can be if you don’t take proper care while driving. If you drive slowly and pay attention, you’ll be just fine. You should switch driving with someone after, at most, half-way through the trip so that you do not get too tired while driving. Watch out for potholes – Due to all the water and ice on or near the road in conjunction with the massive trucks that drive along the route, potholes are a large factor on the Dalton Highway. Only travel on this road during the summer months – From June to August travel on the Dalton usually has pretty moderate temperatures and weather. Temperatures normally range between fifty and seventy degrees Fahrenheit. Use vehicle that is ready for a long trip with potential for inclement weather – You should not venture out on the Dalton Highway with a motorcycle or small car. You should only travel on this road with a larger vehicle with four-wheel drive if at all possible. You should also get your car serviced and inspected before you drive the Dalton Highway. The Dalton Highway is an experience essentially reserved for very experienced, patient and safe drivers. Driving on the road requires the utmost respect for the possible danger it holds. However, it’s an experience like no other. It’s a great way to take in the central and northern Alaskan expanse. 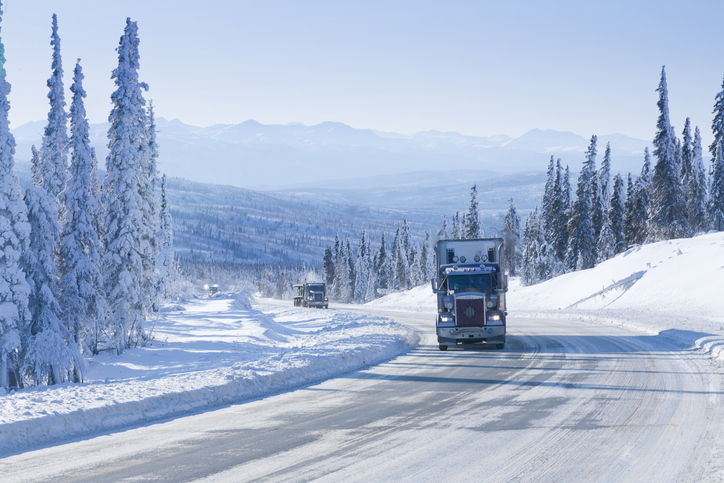 If you have a car that you think could make the trip up the Dalton Highway and want it shipped there call RoadRunner Auto Transport today at 888-777-2123.